Resources Connection Inc. reported revenue of $156.8 million for the fiscal fourth quarter of 2014, up 11.8% (11.6% in constant currency) from $140.2 million in the year-ago period, and $567.2 million for all of fiscal 2014, up 1.96% from $556.3 million in fiscal 2013. Net income totaled $6.9 million for the fiscal fourth quarter, up 30.2% from net income of $5.3 million in the fourth quarter of fiscal 2013, and $19.9 million for the full fiscal year, down 2.9% from net income of $20.5 million in fiscal 2013. The Conference Board Leading Economic Index for the U.S. increased 0.3% in June to 102.2, following a 0.7% increase in May. The Coincident Economic Index increased 0.2% in June to 109.2, following a 0.3% increase in May. The Lagging Economic Index increased 0.5% in June to 124.4, following a 0.3% increase in May. The U.S. economy is likely to experience disappointing growth in 2014 in the absence of a big spring bounce to follow a tough winter, according to a Wall Street Journal survey of 48 economists. Inflation-adjusted gross domestic product is expected to expand by 1.6% this year, a drastic drop from the 2.2% forecast last month. Firms responding to the Federal Reserve Bank of Philadelphia’s Business Outlook Survey indicated continued expansion in the region’s manufacturing sector in July. The diffusion index of current general activity increased from a reading of 17.8 in June to 23.9 in July. The index has remained positive for five consecutive months and is at its highest reading since March 2011. The current new orders and shipments indexes grew substantially this month, increasing 17 points and 19 points, respectively. Both unfilled order and delivery time indexes were positive for the second consecutive month, suggesting continued strengthening conditions. The current indicators for labor market conditions also suggest improved conditions this month. The employment index remained positive, and, although it increased less than one point, it has improved for four consecutive months. The percentage of firms reporting increases in employment (24%) exceeded the percentage reporting decreases (12%). The work week index was positive for the fifth consecutive month and increased five points. St. Louis Federal Reserve president James Bullard’s labor-market views differ from those of U.S. Federal Reserve chairman Janet Yellen. Bullard says the labor market has recovered to prerecession levels, and the government should not expect an influx of new workers. He adds that interest rates may need to be raised soon. Yellen has said there is slack in the labor market. Some workers are unhappy with changes made to the way TaskRabbit matches workers with assignments. The odd jobs site now uses an algorithm to match clients with contractors instead of the previous auction system that allowed workers to bid on tasks. The company says the changes make the site more efficient, but some workers say they have less control over what jobs they take. TaskRabbit representatives say most of the feedback they have received about the overhaul is positive. Brought to you by the American Staffing Association, Staffing World is the largest, most comprehensive convention and expo in the staffing, recruiting, and workforce solutions industry. Each year, thousands of industry executives, professionals, leaders, and innovators convene for this must-attend event. Catch a glimpse of this exciting event in the new Staffing World video, available at staffingworld.net. 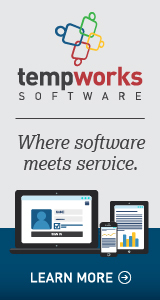 Experience Staffing World, Oct. 13–15 in metro Washington, DC. The convention takes place at the Gaylord National Resort & Convention Center at National Harbor. Visit staffingworld.net for details. Register today and save up to $150 per person. Only ASA certification programs deliver the critical knowledge, credibility, and prestige that staffing and recruiting professionals need to thrive in their careers. The ASA Certified Staffing Professional®, Technical Services CertifiedSM, and Certified Search Consultant® programs will enhance your understanding of state and federal labor and employment law. Start this sizzling summer off right. Invest in yourself or your team—buy now, save 25%, and prepare to earn some of the most recognized credentials in the industry. This sale is just for ASA members and only runs through the end of August, so don’t delay. To receive the 25% discount, enter SUMMERCERT14 in your shopping cart upon checkout. 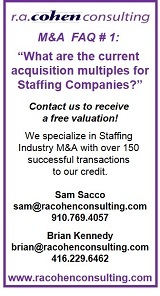 For more information, contact ASA at 703-253-2020 or asacertification@americanstaffing.net. The ASA board of directors and staff welcome the following new members, which joined during the week of July 7. Free State Staffing Services Inc.